(PresseBox) If you have lots of appointments, you should keep your documents in order. It would therefore be very useful to be able to connect your documents directly with a calendar event. This is precisely the solution offered by FileCalendar an app for iPhone, iPad and iPod touch. 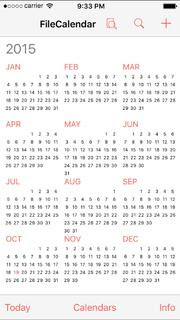 FileCalendar uses the much-liked default calendar on Apple devices. The idea is simple and efficient, documents can be stored and saved with calendar events. You can keep ﬁles for every event always at hand. More than 20 ﬁle types like pictures, movies, text documents, presentations, spreadsheets, PDFs and more can be connected in the blink of an eye. They are always available whether for business or private purposes. FileCalendar is intuitive and easy to use. Only a few clicks and the ﬁles are saved directly to the events, either through the app FileCalendar or through other apps, which you already use to create or edit your documents. Email attachments can be saved to calendar events as well. The documents can then be renamed, shared and edited. Schmidt is a co-founder and partner of the German start-up company Homburg & Schmidt UG (limited liability) that has developed FileCalendar. The company was founded in 2015 and is located in Wiesbaden. The app is available free of charge at the Apple App Store for the period from November 21 to 27. The next FileCalendar version will be released in a few days.